The visual perceptions and the ambient contaminations them in order to interpret the present. Vision_aria is a plan that recalls imaginary feelings through analogic-digital sonorous manipulation them. 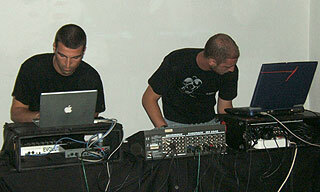 Been born in it you open them 2004, the group is formed from the Neapolitans Luca Iovino (audio technician) and Mario Parascandolo (soundesigner), coming from from various musical experiences, respective from the hip hop underground and the indie rock. A background musical versatile - from Company Flow, Anti-Pop Consortium, Autechre, Matmos, Mum, Brian Eno until Telefon Tel Aviv, Alva Noto and contemporary classic works - it has carried the V.O.A. to to experience new sonorous contexts, animated from sounds electro-minimal, soundscape, riff acoustic with to samplings inspire to you from the real one and the nature. Through our music we imagine to tell the distances between the man and the Time,to feeling the relationship between universe of the feelings and its conscience nelluniverso of the digitalis them. Ensamble musical successful thanks alluded of blot some digital them from the laptop and drumaschine to the field recordings arranges to you with live acoustic instruments. [Miga20] VV.AA "Tangencial" // [Miga25] V.O.A. Project "Struttura"